Please contact your Federal District Representative via email @ www.House.gov. and the operator will patch you through to them. My name is ___________ and I’m from _____. - HR 2066, the 21st Century Civilian Conservation Corps Act! 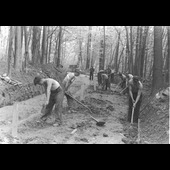 act to re-establish the United States Civilian Conservation Corps. would become stewards of our lands and waters and our future leaders. As a nation we can set the example for other nations follow in world conservation. I also request from my representative a written response! A Dust Bowl storm hits a Great Plains town. I cannot live without the green trees, and nor can you!